The 90-minute event featured eight matches and took place at the Tranzac Club. The event was sold out and the venue was packed. Zombie Hornet and Zombie Burns enter the ring for their tag-team match against Agent Mason and Turner of Z.E.R.O (Zombie Eradication and Raze Operative). The event features human and zombie wrestlers, Mexican luchadores, burlesque performances, and live musical acts. Jasmin the Ring Girl executes a moonsault on Jarvis the Body Snatcher. The Black Mambazo, in a luchadore mask, enters the ring for his match against Pretty Peacock Zombie Dalton Castle. Castle, who came in to Katy Perry's "Peacock," puts a stomping on The Black Mambazo. Mambazo responds by throwing the Peacock over his shoulder while his manager looks on. The Peacock, in turn, throws The Mambazo over his shoulder and wins the match. Dead ring girls wandered around the venue throughout the night. Maria Juana performs a burlesque routine, with a bottle of "blood," during an intermission. RJ City being thrown towards a corner. Skinner, the wrestler behind RJ City, says his persona is basically "Liberace on steroids". 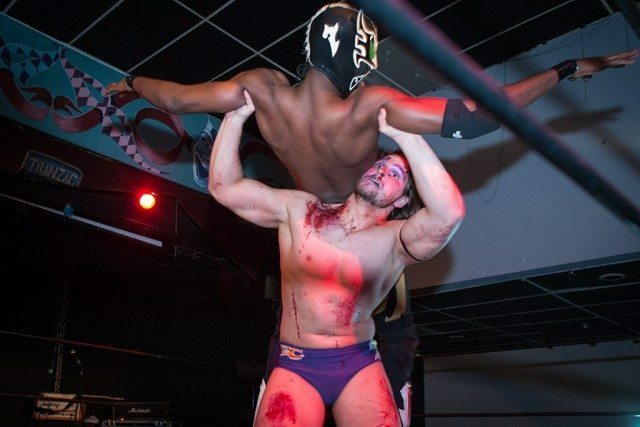 In the main event, Ethan Page, leader of Z.E.R.O., drops a leg from the top ropes on Psycho Mike Zombie. However, Psycho Mike was able to smash a tombstone over Page and retain his Zombie Championship. The old dichotomy would have you choose between brains or brawn, but Ashley Sixx, owner of the Toronto-based entertainment company Fight! Brand and mastermind behind the second-annual Zombie Wrestling event, has opted for both. Sixx says he came up with the concept for Zombie Wrestling after attending the Toronto Zombie Walk. In the middle of the night, he decided to combine the undead with what he and his company specialize in: pro wrestling. The second reincarnation of the event (after its 2012 debut) took place at the Tranzac Club on October 26. It was a raucous affair to say the least, featuring live performances by American metalcore band Kill the Messenger, the thundering crashes of bodies slamming onto the mat, and spontaneous chants for “brains” from the audience. RJ Skinner, a local actor who wrestles under the name RJ City, described the event as like “a live B-Horror movie.” And after sitting through a night replete with decapitations, referees in white hazmat suits, a bloody burlesque routine, disembowelments, Gestapo-like zombie hunters, performers leaping into the crowd, and even a reference to Michael Jackson’s “Thriller,” it’s hard to disagree. According to Sixx, the event brings in diehard and non-wrestling fans alike, and has grown exponentially since last year. Sixx is hopeful the zombie-centric spectacle will become a regular event, but until then he says Zombie Wrestling will be held annually, on the same day as the Toronto Zombie Walk.